If you are a regular reader of my Blog, you already know about the 70273 Project. 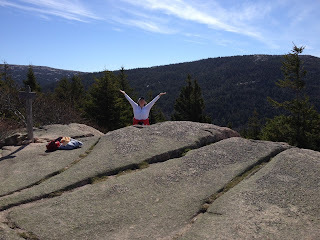 If you are new to my Blog, please read more about it on Jeanne Hewell-Chamber’s Blog (here). I have made individual blocks for the project in the past. 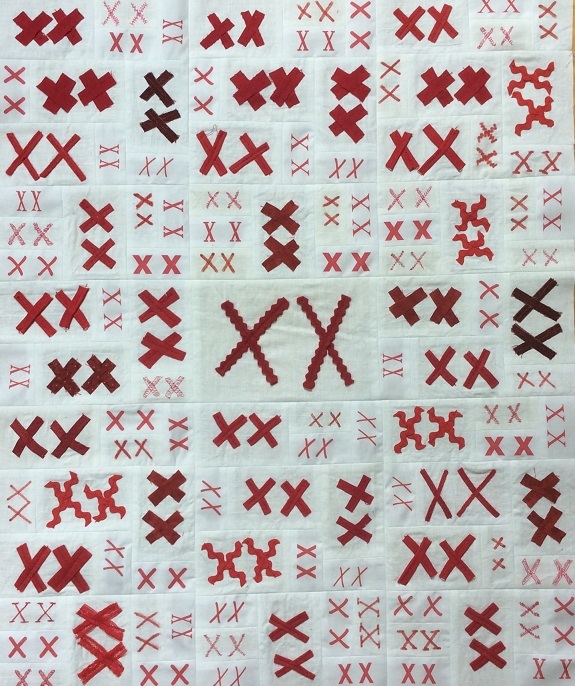 Each double X represents one of the 70,273 mentally and/or physically challenged people murdered by the Nazi’s between January, 1940 and August, 1941. Jeanne has taken on the monumental task of honoring every single one of these people by making quilts. At first, you could make a block in one of the 3 sizes listed on her site. But, to honor more people more quickly, she invented the “Long and Skinny” and the “Middling”. Instructions for both are listed on her site (here). I thought this “Middling” (18” x 22”) was a perfect project to complete over the Memorial Day weekend. 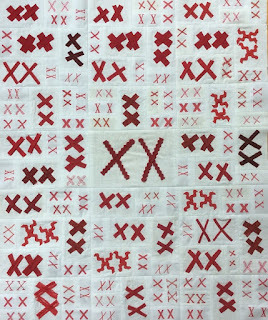 This little quilt “remembers” 115 individuals. I will quilt it and send it off, after I get my label from Jeanne. This project is so important to me. 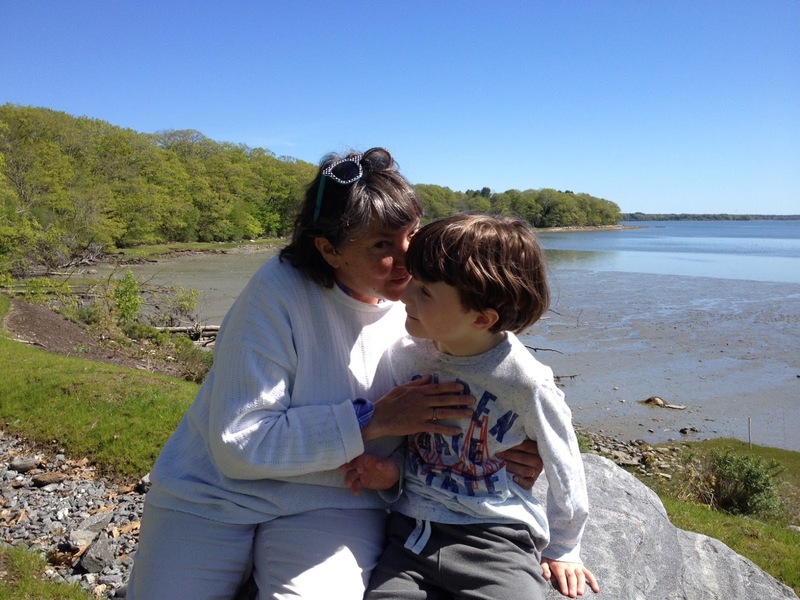 As some of you know our grandson has significant autism. I cannot conceive of my world without him! 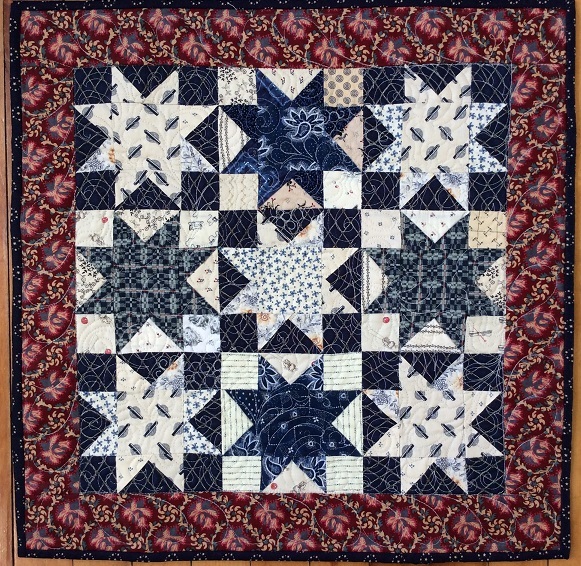 I also finished piecing together this Veteran’s quilt to be handed off to our “Quilting Angel” Sharon Patterson. And, we had a little time left for a hike with our little man! Congratulations #72, Rachael from Blue Mountain Daisy. I had chosen a few items to include with the quilt, but since I follow Rachael’s Blog I decided to customize the “extra” goodies to her taste. Also, the fact that it is now going to Australia makes me re-think the size of the box! DO check out Rachael's Blog (here) it is so much fun! I want to thank each and every one of you for taking the time to comment on my pressing questions. There were some very thought provoking answers and I have to say I learned a great deal about how other quilters handle their Internet time. First, I must say that I realize that the answers were skewed by the fact that I asked these questions on a Blog, so of course you all read Blogs! I think it would be interesting if I asked these same questions on Facebook (but then I’m not sure I could find them again!). 29 of you are Bloggers only. Included in that number are those of you who don’t have a Blog, but read them on a regular basis. 20 of you forward thinking 21st century quilters, utilize many of the Internet’s social network sites. Gladi of Gladi’s Quilts cannot post a comment on my Blog (above my technical ability grade, but probably has something to do with Blogspot vs what she uses). I have included it here as I think it really says what most us feel. Wendy at the blog “The Constant Quilter” (an excellent blog – check it out if you aren’t already a reader!) asked her readers about their use of social media. She expressed some concern that a lot of bloggers may be quitting or considering quitting blogging and moving to other ways to share such as Facebook, instagram, etc. Technically I don’t have the means to directly respond on her blog, so thought I’d respond here. I can hardly believe that I’ve been blogging for almost 5 years. When I started I wasn’t sure I would last more than a few weeks, but I learned that I enjoy taking the time to write about what I’m doing and I enjoy being part of the quilt blogging community. I’ve met some great people!! I very much enjoy reading other blogs and start every day with about an hour of blog reading while I quietly enjoy my morning coffee. I enjoy seeing the projects and hearing the stories about the projects. I do not have a Facebook account, but my husband has one (on which he rarely posts) so that we can stay connected with a very few people we really care about, but otherwise much of what is there is a waste of time. I rarely look at Facebook and I do not do instagram or twitter. I have a Pinterest site so I can save ideas for inspiration, but I usually only look at it for a few minutes before bedtime when I’m too tired to read. Time is precious and we need to be mindful of how we are spending it and making sure we don’t just fritter it away. A lot of social media lends itself to “frittering.” I’m lucky I’m not drawn to it. I read through Wendy’s responses and am happy to say that a lot of her responders agree with me, i.e. that we like blogs because of the depth of the information and the stories. We hope bloggers keep going! There are many good aspects to all the different social media. Many prefer Instagram for posting pictures. Most say that they are on Facebook only to catch up with family members or specific groups that they belong to. I have to admit to being one of these myself. It is the only way I can keep up with the younger members of my family who live far away. And, there are some wonderful groups that are specific to my interests, ie. 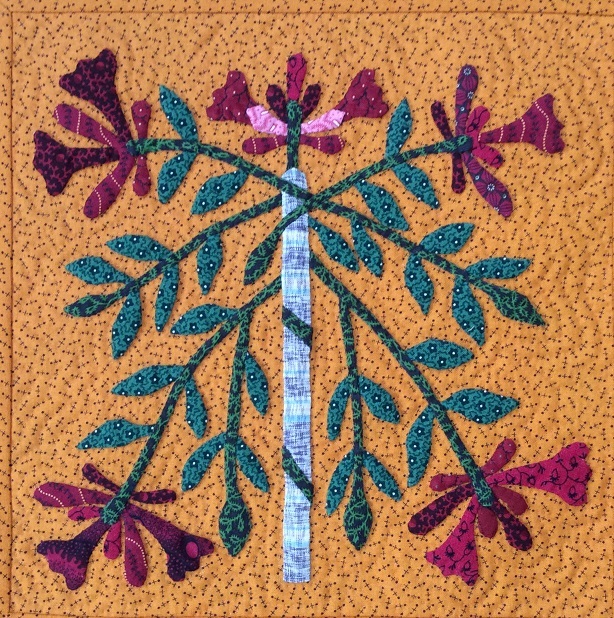 hand applique, hand quilting and of course antique quilts. Many of you commented that (like me) you enjoy the slower pace and more informative content that a Blog offers. I also like to use mine as a personal journal that I can refer back to from time to time. I use “Blog to Print” and print out my entire Blog at the end of every year. It is not inexpensive, but it is nice to have a printed copy to refer to rather than scrolling through months of posts. It seems that whatever our preferences, the majority of us make a concerted effort to limit our Internet time in favor of more time in the sewing room! 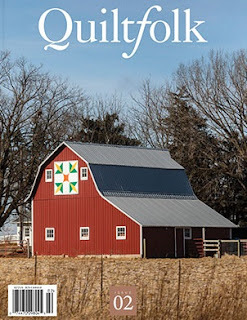 I was the lucky winner of Audrey’s (Quilty Folk) giveaway on her final Quilty 365 post and linkup. I was so excited to see all the Quilty 365 progress I didn’t even realize she was doing a giveaway. (I have the attention span of a Clown fish) I won a gift certificate to Connecting Threads and these lovely threads and package of needles. It is kind of eerie, I don’t know how Audrey could have known which 3 colors I needed to fill out my thread box. I guess it really is true that great minds think alike! See the empty spots for just the right colors? Thanks Audrey – all filled! Here are Blockheads #9 & #10, just in time for week 11! Week 11 is designed by Lisa Bonjean and can be found (here). You can find all the blocks on all five of the designers blogs. 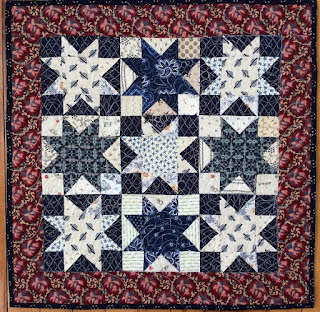 Block #9 - Ohio Star Variation by Jo Morton. I loved making this little one. 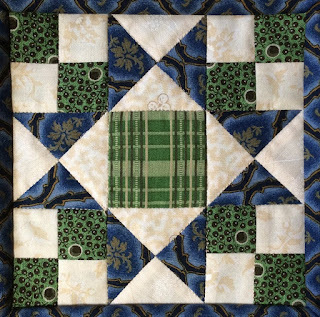 I used an older Jo Morton for the back and some charm squares from Betsy Chutchian’s Hope’s Journey line. 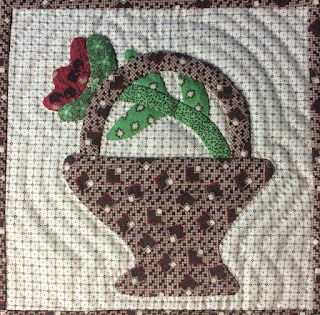 Block #10 - Basket and Flower by Jan Patek. A sweet little basket and sturdy little flower. Unfortunately, I didn’t have the pattern or picture with me on our weekend away, so I appliqued the handle over the flower instead of leaving it in the background. Do you think anyone will notice? Wink! Once again, I used a few tiny pieces from Hope’s Journey. I can’t wait to get to Cyndi’s (Busy Thimble) to pick up the entire line of Betsy’s Rachel Remembered. It is a beautiful line. I love every fabric in it! My little potholder blocks are piling up. I am trying to decide whether to start stitching them together in the order of publication, or wait until the end and arrange them the way I want. I am inclined to leave them in the order of publication. After all, that would be the most historically important way to do it. One hundred years from now, people are going to want to know in what order they were published. Since there will be 48 blocks, my layout will be 6 blocks across and 8 down, which would mean there would be 3 baskets in row 2 alone. Yup, I’m over thinking this one! I don’t think it makes a fig of difference because they are all just as cute as can be! This one was a bugger. Lots of tiny appliques. Because I reduced mine to 10" I adapted one of the flowers to make it a bit easier. For the most part I have followed Esther’s lead. I tried to match the fabric that Esther used for the trellis post that the vine is climbing on. I found a very old Roberta Horton homespun which I think matches pretty well. Boy, did I love those old Roberta Horton fabrics. They are so soft and they needle beautifully. I wish I had a bolt of every one of them! Visit the Shenandoah Valley Botanical Album blog (here) to see all the wonderful renditions. Once again, there are some very clever renditions of this block! And, I hope all of you had a lovely Mother's Day weekend. 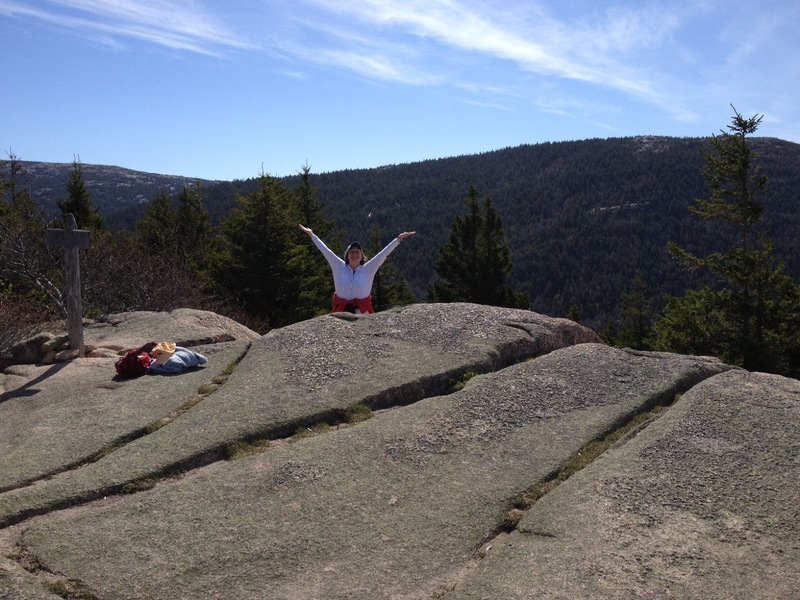 We had a fantastic hike on Mt Desert Island on Saturday before the rain on Sunday. We hiked North Bubble this time. A bit higher and more strenuous than South Bubble, but every bit as beautiful. They both overlook Jordan Pond. We only go to the island before Memorial Day and after Columbus Day, otherwise the drive along Rt. 1 takes twice as long! Now that I have your attention, I am offering a giveaway to go along with my burning question. 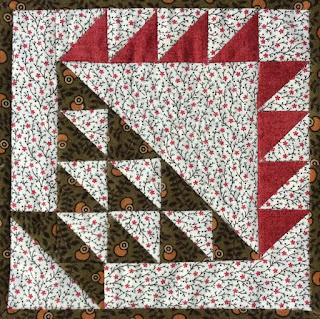 If you make it to the end of this long winded post, leave me a comment and one of you will receive this little quilt as a parting gift. Actually, it is a two part question – 1) are you on Facebook (or other social media) and 2) If you are, what is the percentage of your time spent on other social media vs Blogging? I ask this question because, I feel like a 19th century woman hopelessly trapped in the 21st century. In 1994 we bought our first computer. It was really for the children to use as an educational resource. I swore that I was NEVER going to use it and I kept my promise for quite while. Even after the 4th or 5th computer I found I was still only using it for e-mail. Then my friend Cyndi (Busy Thimble) said she had started a Blog. What???? My friend, my cohort, my inspiration for so many of my reproduction quilts was heading over to the dark side! How could I let her get trapped in this world all by herself? I spent the next few years “lurking” around Blogland until I started my own in September of 2014. It has been a wonderful experience. I have “chatted” with so many wonderful quilters and have even had the privilege of meeting a few of you face to face. 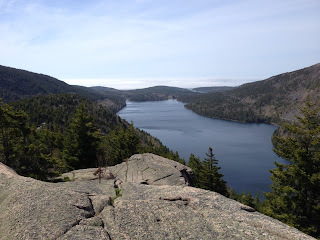 I enjoy the slower pace of a Blog and I do not plan to give it up any time soon. I have however noticed that a lot of people are moving to the faster paced and perhaps easier to post venues. I am on Facebook, in fact I have two accounts. Both were set up by other (well meaning) people and I can’t figure out how to get the older one down (see what I mean?). My dilemma is how to best utilize my time. I am not willing to ignore my Blog buddies only to scroll through Facebook for hours on end (it takes me hours because just when I see something I like, whoosh, it’s gone and I spend way too long looking for it again – see what I mean????). So, I thought if I had input from all of you as to how you spend your Internet time it might help me in my quest to organize mine! Thanks for working your way down to this point. I’ve kept you so long I promise I will add a few surprises to keep the little quilt company in the package. I will use my random generator (grandson picks the number) and announce a winner on Thursday May 25. If you are a “no reply” Blogger, please make sure to leave me your e-mail address so that I can contact you. Thanks for your time! 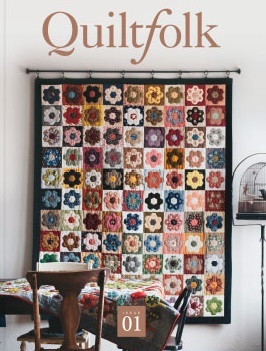 I subscribed to the new magazine Quiltfolk a while back. After reading the first issue, I was hooked. I love everything about it. The subject matter, the writing and even the quality of the paper (I’m very fussy about my paper). Issue 02 arrived at my door last week. I immediately sat down and read it cover to cover. The magazine focuses on a particular region each time. This issue covers Iowa and without giving too much away… I learned about the very interesting Amana colonies and the wool mills in Amana. There is a wonderful article on the marvelous Judy Martin and I learned lots of fascinating things about Maryanne Fons that I never knew. And... Well, just check out their website (here). It is time to link up with all the adorable little swap quilts from Lori’s (Humble Quilts) swap. This is the little I received from Patty Harants in Tennessee. How cute is this? 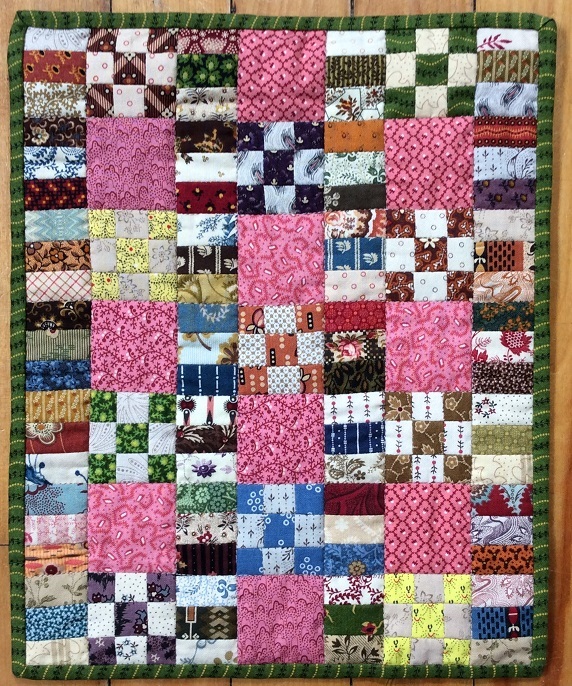 She sent me an e-mail a few weeks before I received it saying she had had carpal tunnel surgery and could not hand quilt it the way she wanted to. She hoped it would be back from the machine quilter (I’m sorry I don’t have her name) in time and sure enough – here it is! I just love it! And she sent along a marking pen and these cute little bobbin bikinis. I had never heard of them but boy are they cute. And, look at this… a fat quarter designed by the one and only Patty Harants herself! 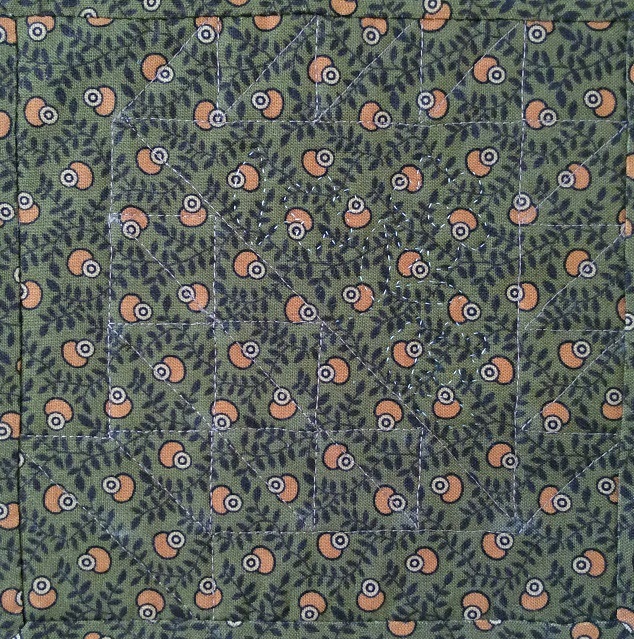 Everyone who knows me, knows I have an extensive (to say the least) collection of reproduction fabrics and to my amazement, I did not have this one! Thanks a million and a half Patty! Click (here) to see the little quilt I made for Andrea. And check out all the swaps on Lori’s blog (here). This swap is so much fun. "Basket of Triangles" by Betsy Chutchian. Seems like I get one of these little guys done just in time for the next one. Can’t complain. I am at least keeping my head above water (so far). 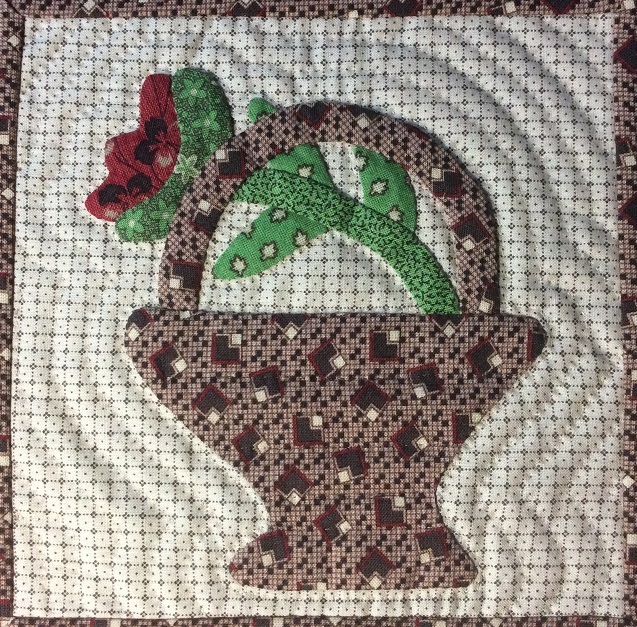 I hand quilted some posies in the basket which was a waste of time since you cannot see it on the front. You can spot a little of it on the back. Click (here) to see Betsy’s beautiful blocks. She is making a mini version (yes, blocks do come in sizes smaller than 6”) as well. Check out this week’s block by Jo Morton (here). I started mine in November 2015 and finished the top in November 2016. 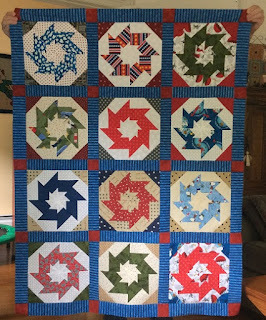 I had an absolute ball (no pun intended) hand appliqueing one little vintage feedsack circle each morning for a full year. 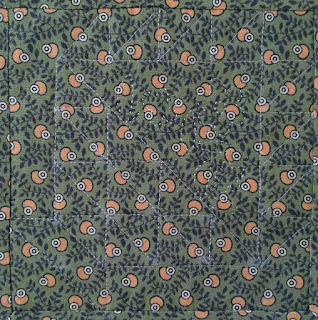 I'm thinking of calling it "Crop Circles" since it is made entirely of vintage feedsacks (over 700 different prints!). 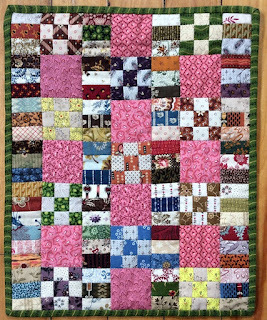 Please check out all the fabulous quilts on Audrey’s link (here).